Currently run by the founders and their eldest daughter, Perry’s Fine, Antique & Estate Jewelry was honored as one of Charlotte’s top five most outstanding family-owned businesses. Overall excellence, innovation, ethics, philanthropy and contributions to the community were among the criteria for the award. Perry’s Fine, Antique & Estate Jewelry was honored as one of Charlotte’s top five most outstanding family-owned businesses at the Charlotte Business Journal’s inaugural Family Business Awards on March 23. Overall excellence, innovation, ethics, philanthropy and contributions to the Charlotte region were among the criteria for the award. 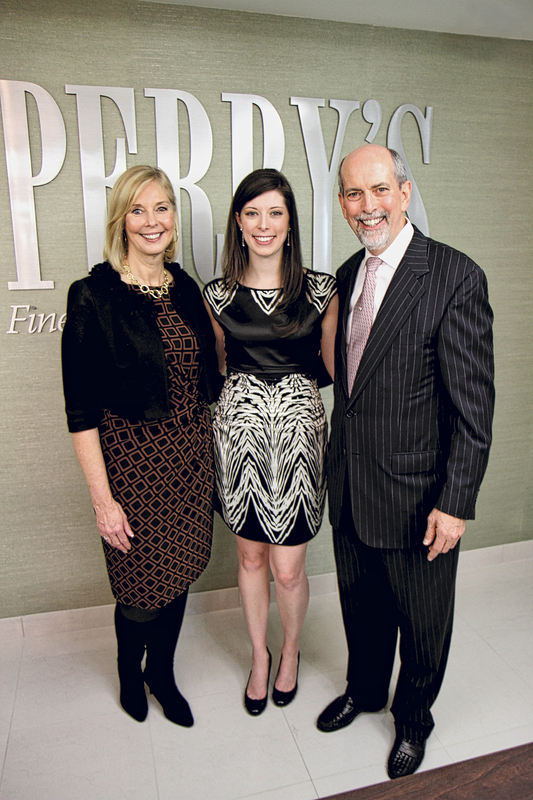 The winner of the 21-50 employees category, Perry’s was founded in 1978 by husband-and-wife team Ernest and Priscilla Perry and is currently run by the founders and their daughter Hadley Perry, who serves as vice president and is transitioning into the role of primary spokesperson for the company. Hundreds of business leaders gathered at the Ritz-Carlton to celebrate 19 family-owned businesses that were named finalists. The finalists were divided into five categories: 20 or fewer employees, 21-50 employees, 51-75 employees, 76-225 employees and 226+ employees. A winner was celebrated in each category. Throughout its history, various family members have worked at Perry’s, including the founders’ parents and children. While Ernest and Priscilla Perry have no plans to retire soon, Hadley Perry is gradually assuming leadership of the company. Under Hadley’s influence, bridal sales have increased 14.6 percent (compounded average growth over five years). Dollar-wise the bridal business has nearly doubled, and the business as a whole has grown as well. Bridal sales have gone from comprising approximately 25 percent of total sales to almost 40 percent of total sales (37.1 percent) in the last five years. Custom design sales have increased 15 percent in the past three years. All of this is a great testament to Hadley’s knowledge and understanding of the Millennial-generation and of the bridal industry consumers. Other winners in the inaugural Family Business Awards include Hodges Family Farm (under 20 employees), Zapata Inc. (51-75 employees), The Roby Family of Cos. (76-255 employees) and CTE (226+ employees). Perry’s applauds each of these honorees as well as the finalists in each category. In business since 1978, Perry’s Fine, Antique and Estate Jewelry is one of the nation’s finest antique and estate jewelers. Perry’s buys, sells, repairs and appraises fine, vintage, antique and estate jewelry, gold, coins, diamonds, silver, platinum and more. Custom design is a growing area for Perry’s with 3D printing and computer technology that allows customers and Perry’s staff to collaborate throughout the process. The firm also provides appraisal services for a wide range of collectible and personal property.